Raleigh, N.C. Governor Pat McCrory has announced that five North Carolinians from diverse artistic traditions will be awarded the state's Heritage Awards, May 20, 2014 at the A.J. Fletcher Opera House in the Duke Energy Center for the Performing Arts in Raleigh. The 2014 North Carolina Heritage Award recipients are: Bobby Hicks, a 10-time Grammy award-winning bluegrass fiddler; Susan Morgan Leveille, a weaver and grand-niece of Penland founder Lucy Morgan; Sid Luck, a fifth-generation potter from Seagrove; Bill Myers, whose band The Monitors has played rhythm and blues and jazz music for more than 50 years; and Arnold Richardson, a Haliwa-Saponi artist who has influenced the revitalization of North Carolina Indian arts. "I want to congratulate this year's winners and thank them for helping preserve our cultural heritage. Our artistic history is the foundation of the quality of life that attracts so many people to North Carolina," Governor McCrory said. "I'm grateful to the North Carolina Arts Council, not only for their work in this program, but for ensuring the arts will continue to be a vibrant part of North Carolina's future." Since 1989, the North Carolina Heritage Award has honored the folk artists of the state, deepening awareness of the stories, music, and artistry that comprise our rich and diverse cultural traditions. "As North Carolinians, we celebrate the creative and passionate artists working within the communities of our state to keep our cultural traditions alive," said Susan Kluttz, Secretary of the North Carolina Department of Cultural Resources. "Their mastery preserves our heritage and makes North Carolina a better state, and we are so proud of their outstanding skill, unparalleled diligence and eager willingness to share their artistry with the citizens of North Carolina and beyond." The Arts Council's announcement comes on the heels of the national recognition of Sheila Kay Adams, a seventh-generation ballad singer, musicians and storyteller from Madison County, who was awarded a National Heritage Fellowship by the National Endowment for the Arts in June. A live awards presentation of the NEA Heritage Fellowship concert is scheduled Friday, Sept. 27 at 8 p.m. The program will include a performance by the Madison County native. Ms. Adams is one of 12 traditional artists from North Carolina that have received this national award since it began in 1982. "The Arts Council is proud that our agency's mission includes the documentation of cultural traditions that have been shaped and passed down over generations here in North Carolina, said Wayne Martin, Executive Director of the N.C. Arts Council. "The artists who receive this lifetime achievement award keep our citizens connected to our state's heritage and to the extraordinary arts that flourish in every community, large in small, in the state." This year Pinecone, the Piedmont Council on the Traditional Arts, will partner with the Department of Cultural Resources and produce the ceremony in May 2014. While growing up in a musical family in Newton, N.C., Bobby Hicks discovered a talent and a passion for the fiddle. Immersed in the string band traditions of the Western Piedmont, a young Mr. Hicks began playing as one of Bill Monroe's Bluegrass Boys 60 years ago. In his-six year association with the Father of Bluegrass, Mr. Hicks helped pioneer the twin fiddle sound and recorded on some of the classic tunes of the genre. His five-string fiddle song left an indelible mark on the history of bluegrass music and on the generations of fiddlers who have followed in his steps. Not content with mastery of only one genre, Bobby Hicks left Bill Monroe's band and spent a decade playing in country and western ensembles throughout the western part of the United States. He returned again to sounds more rooted in his Catawba County upbringing in 1980 when he joined the Ricky Skaggs band. In more than 20 years as a member of that band and its successor Kentucky Thunder, Mr. Hicks played on numerous hit records that resulted in 10 Grammy awards. Since his nominal retirement as a touring musician, Mr. Hicks has resided in Madison County, N.C. From his home there he has helped to run a weekly jam in Marshall and formed a super group with other legends of bluegrass music. "Master fiddler Bobby Hicks' knowledge of tradition and his innovative style have been instrumental in shaping the bluegrass sound as we know it today, and his career is an example of why North Carolina plays such a large role in the story of traditional music in America," said N.C. Folklife Director Sally Peterson. Susan Morgan Leveille immersed herself in the culture of weaving from a young age. She first sat at a loom to weave at age seven and quickly grew to be a skilled craftsperson. Her family lineage made her destined for equal skill as a teacher, scholar, and advocate of the fiber arts tradition in Western North Carolina. Ms. Leveille's great-aunt, Lucy Morgan, founded the Penland School of Craft and devoted herself to reviving weaving traditions in North Carolina's mountains. Through association with Penland, the Mountain Heritage Center, and numerous schools and colleges, Ms. Leveille has continued to strengthen and disseminate the art of weaving. In the process, she has instructed dozens of both professional and aspiring weavers over the last four decades. Her own work has been widely displayed, and Ms. Leveille has owned a gallery in Dillsboro for many years. Ms. Leveille has devoted a lifetime to the development of the arts and crafts industry in Western North Carolina. "Weaver Susan Leveille's legacy extends way beyond her exquisite weaving," said Peterson. "She has taught countless others to develop artistically and her advocacy efforts for the traditional arts have helped many to supplement their income through craft production." An Interview with Susan M. Leveille in Western Carolina University Hunter Library Digital Collection. A fifth-generation potter from the historic pottery region of Seagrove, Sid Luck learned at the wheels of his father, grandfather, and numerous other potters who populated the area during his youth. Starting at the age of 12, Mr. Luck worked at Cole's pottery where he developed the speed and precision of a production potter. Knowing that a career in pottery was unlikely, Mr. Luck served in the Marines before going to college and then taught chemistry and science for 18 years. Throughout his career as a teacher, Mr. Luck continued making pottery in his spare time, eventually building a shop onto his property. 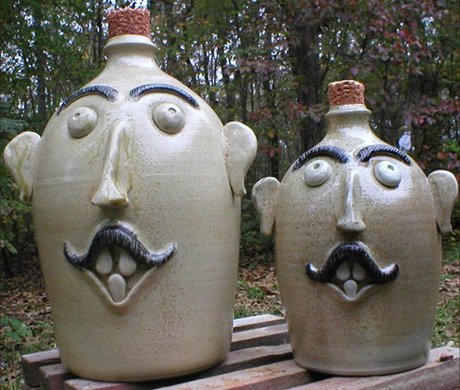 In 1990, Sid Luck retired from teaching to make pottery full time. In the years since, he has become one of the most prolific and beloved potters in North Carolina. In addition to operating Luck's Wares six days a week, Mr. Luck also finds time to mentor aspiring potters of all ages. He regularly takes apprentices from across the state and country, and directs the Traditional Arts Programs for Students (TAPS) held at the North Carolina Pottery Center. 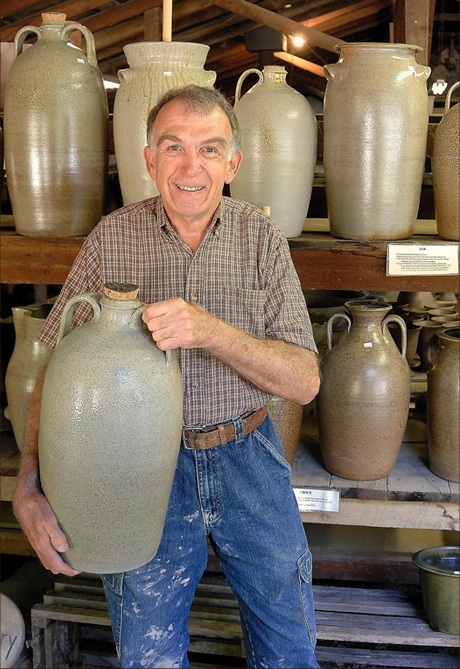 Closer to home, he is cultivating additional generations of Seagrove potters - his sons Jason and Matt are excellent artists and his young grandchildren have recently become the seventh generation of Luck potters to work in North Carolina. "Fifth-generation potter Sid Luck shares his time, knowledge and expertise freely with all who come his way, and his local teaching insures that pottery traditions will thrive in Seagrove for generations to come," Peterson said. For almost 60 years, Bill Myers has led his band The Monitors while continuing to educate successive generations of students as a band teacher and school administrator. As the co-founder and longtime leader of The Monitors, Mr. Myers combines vernacular musical styles of eastern North Carolina into a tightly-wound, supremely danceable sound that defies simple categorization into jazz or rhythm and blues. Mr. Myers, his band, and the music they make are so rooted in the inland east of North Carolina that they were invited to represent our state at the 2011 Smithsonian Folklife Festival. Growing up in Greenville, N.C., Bill Myers admired the music around him - at home, at church, at school and during holiday celebrations. 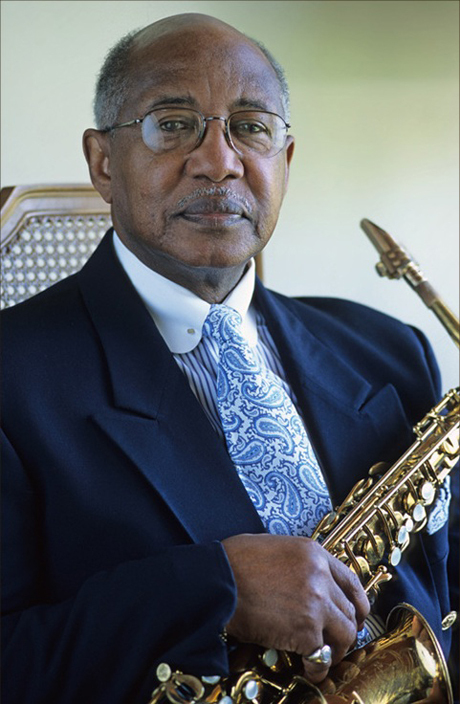 A fascination with this music and the instruments that produced it led him to serious study of the saxophone in high school and in college. After college, Mr. Myers spent his days as a teacher and administrator in Wilson County schools, and many of his nights and weekends playing in clubs and at various community gatherings and concerts. Since retiring as an assistant school superintendent, he has devoted himself full time to making certain that the lives and music of African-American in eastern North Carolina are remembered, recognized and celebrated. "Bill Myers has led the jazz band the Monitors for nearly 60 years, capitalizing on the rich jazz, rhythm and blues and funk traditions of eastern North Carolina," said Peterson. "He's a natural-born teacher as well as a musician, and he's been a guide and a mentor not only to musicians, but to all who share his goals of strengthening community and honoring the gifts of every individual." Haliwa-Saponi artist Arnold Richardson's efforts to revitalize the cultural heritage of eastern North Carolina's American Indians have long been credited for the resurgence of artistic vitality among the eastern tribes. Mr. Richardson is musician and an artist working in many different indigenous artistic traditions. Throughout a career spanning more than four decades, Arnold Richardson has taught tribal arts traditions to the Haliwa-Saponi as well as educating other state recognized tribes about revitalizing their own heritage. A list of Mr. Richardson's accomplishments is staggering both for its depth and breadth. Every few years finds him researching and mastering a new tradition that he then teaches to a growing number of interested students at his home and in various communities in N.C. Most recently, in addition to his prize-winning stone sculpture, pottery and beadwork, he has been recognized for the excellence of his gourd carving, an art form that he continues to perfect even while engaging in activities as varied as touring with the North Carolina Symphony and welcoming students of all ages, abilities, and ethnicities into his home in the Haliwa-Saponi community of Hollister. "Arnold Richardson has studied, mastered and taught many of the artistic and performance traditions that mark contemporary eastern North Carolina Indian cultural expression," said Peterson. "Many Eastern Indian artists today cite Mr. Richardson's influence, instruction and inspiration as fundamental to their own artistic development." The program honoring recipients of the North Carolina Heritage Award is open to the public and is scheduled Tuesday, May 20, 2014 at the A.J. Fletcher Opera House in the Duke Energy Center for the Performing Arts in downtown Raleigh. Tickets are $22 available from PineCone, Piedmont Council of Traditional Arts, at https://www.pinecone.org/down-home-series.php.